As the Commercial goes, everyone loves Marineland. Everyone but me. I think it’s WRONG. This blog post was inspired by the blog Platform 9 3/4 after the blogger’s visit to the very sad and neglected animals in “The Guindy National Park” in Chennai, India. The blogger was outraged at the sorry conditions where the animals lived, the weak looking monkeys and birds kept in small cages, unable to fly. 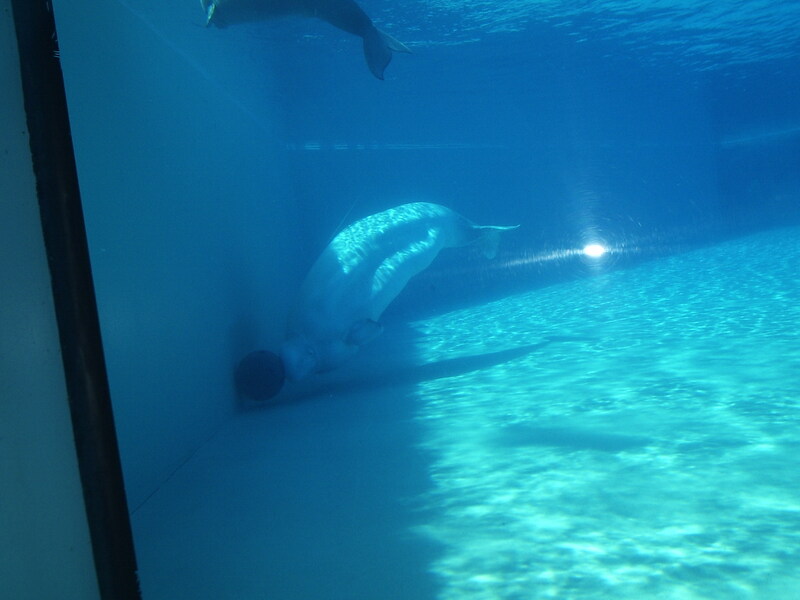 I felt the same sad way when I visited Niagara Falls’ biggest attraction, Marineland. Marineland, famed for its 450 foot Skyscreamer ride, can’t decide whether it is a zoo, an aquarium, or an amusement park. Maybe it should skip the first two and stick to the rides. The park has a lot of marine life but clearly they are exploited for the entertainment and not an educational value. When we visited the beluga tank, for example, it was small and bare inside, with one small ball for the belugas to play with. There was no visible literature about how beluga populations have been hurt by whaling, fishing, and motor boats. That is why I posted this picture in the photo challenge: wrong. hi Madelaine! Thanks for stopping by. Have you been to Marineland? If I never go again, it will be not long enough. I’ve never been there but to others that are similar and they really do upset me……especially the circus elephants…..NEVER again!!! Very sad …People just see them as toys and don’t realize that they too have feelings and life inside them just as we do ..
thanks for your comment, my post was inspired by yours. I think that zoos and aquariums hold a purpose on this planet, but they must serve the animals and serve as an educational resource, not a gawkfest at a caged creature.